Armed & Ready has opened for business in Gallipolis at 2145 Eastern Ave., Suite H, in the Super Walmart Center Plaza. 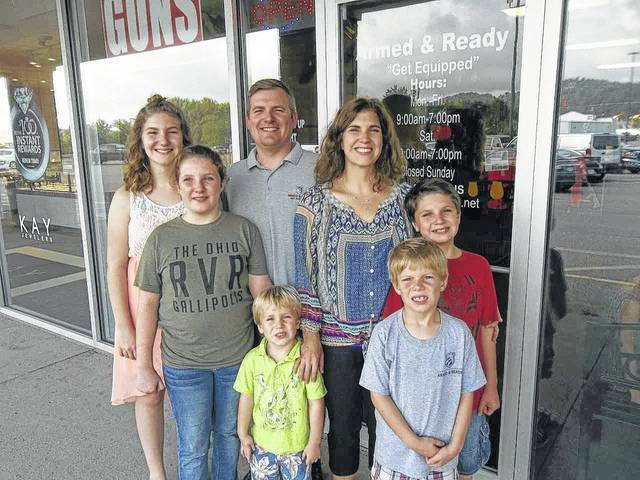 Owners of Armed & Ready, Randy & Sally (Garrett) Patterson, were both born and raised in Gallipolis, and say they’re “glad to be bringing their firearms store to their hometown.” This is the second location of Armed & Ready, with the first operating in Jackson. Both locations are open Monday- Friday, 9 a.m. – 7 p.m., Saturday, 10 a.m. – 7 p.m., closed Sunday. They may be reached at 740-856-GUNS (4867). Armed & Ready has a large selection of new and used firearms, and ammo. They also carry optics, knives, hunting supplies, conceal carry items, archery, and other accessories. Grand opening event scheduled for Labor Day Weekend Sept. 1 – 2. In addition to being the parents of five children, pictured, the Pattersons also pastor Kingdom Ministries in Bidwell and Jackson.